The synthetic substance known as K2 or Spice gives users a marijuana-like high. It's known as K2 or Spice, a synthetic substance that, when smoked, gives users a marijuana-like high, according to drug authorities. Its growing popularity is causing increasing alarm among health care professionals, law enforcement authorities and lawmakers, with one Drug Enforcement Agency official calling its use the equivalent of "playing Russian roulette." Should some illegal drugs be legalized? Manufactured in Asia and sold online or in local stores, K2 and similar substances are marketed as herbal incense. A disclaimer on a K2-selling Web site reads: "K2Herbal products are novelty incenses and are not for consumption." Sold in various flavors in 3-gram bags, the product consists of herbs that are sprayed with synthetic substances that mimic THC, the high-causing natural chemical found in marijuana. Health and drug officials say the danger in using such products is the unregulated nature of their production and makeup. "Our biggest concern is that this particular chemical is likely manufactured in a dorm-room setting. And these dorm-room scientists are not going to be exhibiting a lot of quality assurance techniques," says Dr. Gaylord Lopez, a toxicologist and head of the Georgia Poison Center. As a result, there's a potential for users to inhale contaminants along with the substance they think they're smoking, Lopez said, which may be a contributing factor in the adverse symptoms some of its users have been experiencing. "Synthetic drugs and herbal drug products like Spice and K2 are not made in a controlled environment and thus you are playing Russian roulette when it comes to these types of products," said Dawn Dearden, a spokeswoman for the DEA, which first began receiving reports about abuse of the substance last year. "There is no way, outside of a controlled laboratory environment, to determine the chemical makeup, synthetic ingredients or amounts, and therefore there is no way to determine with any accuracy what the potentially harmful effects may be." You are playing Russian roulette when it comes to these types of products. Lopez says his center first heard of the substance in December when Georgia hospitals began reporting patients who had used K2 or Spice. Since then, the center has seen a spike in cases, with 20 people -- mostly teenagers -- visiting emergency rooms with such symptoms as heart palpitations and respiratory issues. In the most serious case, an otherwise healthy teenage boy, who has since recovered, lapsed into a coma, Lopez said. According to Dearden, additional side effects can include panic attacks, hallucinations, delusions, vomiting, increased agitation and dilated pupils. Around the center, Lopez said his employees have begun referring to the substance as "Scary Spice." Earlier this month, Kansas became the first state to ban synthetic marijuana. 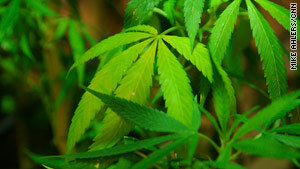 Kansas state Sen. Jim Barnett, a supporter of the effort, said the ban was prompted by reports of abuse of K2 and similar products in cities across the state among high school students and prison parolees who were using it as an alternative to pot to avoid a positive drug test. Lawmakers in several other states are considering similar legislation, including Georgia, Utah, Missouri, Tennessee, Kentucky, North Dakota and Illinois. "Although it is a synthetic drug, it is still a drug with a high potential for abuse," says Barnett, who is a physician. "It was our desire in Kansas to be ahead of the problem." K2 has already been banned in some European countries, including Britain, Germany, Poland and France, and the DEA lists it as a drug of concern in the United States. "We are seeing several indications that these THC-like substances could become a significant problem both domestically and internationally," Dearden says. She says the agency is in "the preliminary stages of determining whether or not some or all of (synthetic substances) need to be controlled."